Over 40 minutes of co-op beta footage has been released of Trine 2. Nanny Ogg sang that a Wizard's Staff has a knob on the end, and nothing could be truer. Another truism is that co-op games should encourage more than just gamers running around the same environment. 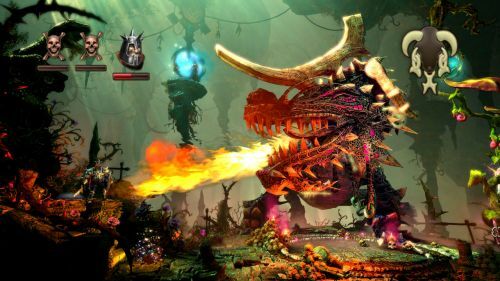 If full co-operation and teamwork is your bag, then this 40 minutes of beta footage for Trine 2 will appeal. The video is taken from the recent PC beta of the game, available to people who have preordered the game via Steam. Throughout the playthrough you get a sense of exactly how much co-operation is needed if you are going to be successful. Each character has a different skill set that you will combine to cross chasms etc. The footage also shows what happens when less than 3 players are tackling the co-op. Rather than losing out on using one character, you can swap between who is available. Hopefully, this will means you can solve all the puzzles, no matter how many people are playing. Trine 2 is reportedly out in December, but the game has already slipped a few times. I can't tell you whether the game will slip again, but I can say from personal experience how useful the knob at the end of a Wizard's Staff is (when tackling puzzles in a fantasy world). Page created in 0.2502 seconds.